Graphic facilitation is also called graphic recording, visual listening, scribing or sketch note taking. It is an effective way of facilitating meetings and providing immediate visual feedback. The header image above was drawn at a Firefly Learning event from a few years ago – in that time they have indeed scaled up to an impressive degree. Graphic facilitation is the basis for any Rich picture project. I usually work alongside consultants and facilitators as part of a team but have experience in running workshops, events and interviews as a sole facilitator. 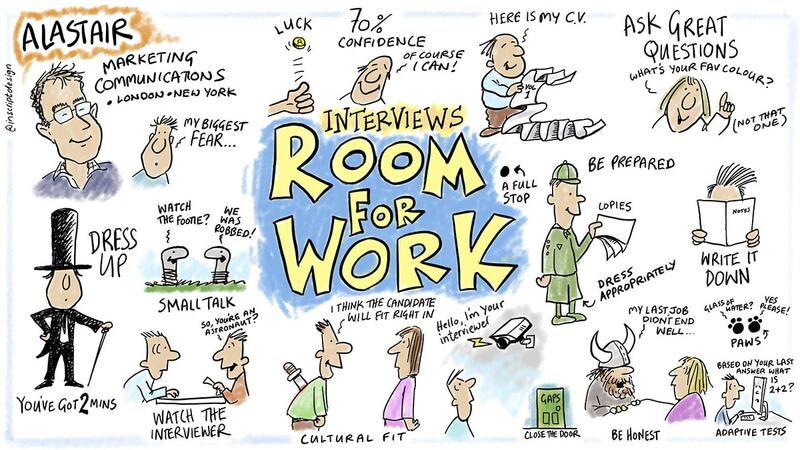 The sketch notes below were produced during a series of consultant-led interviews where the cartoon notes helped capture stories for the Rich picture. 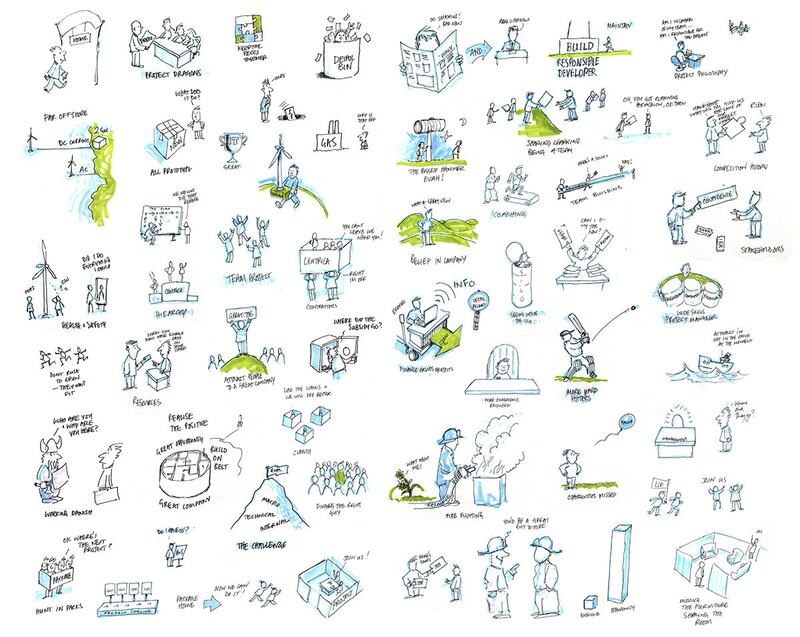 The image below shows the cartoon sketch notes taken at a series of short talks and set out as a Rich picture of visuals. The theme of the seminar was around how digital data could enable local government services to be more entered around the citizen. One example is the ‘Tell Us once’ initiative where 34 different local services could be provided from a single registration rather than multiple registrations. Another is the sharing of data between social services to help protect vulnerable children. 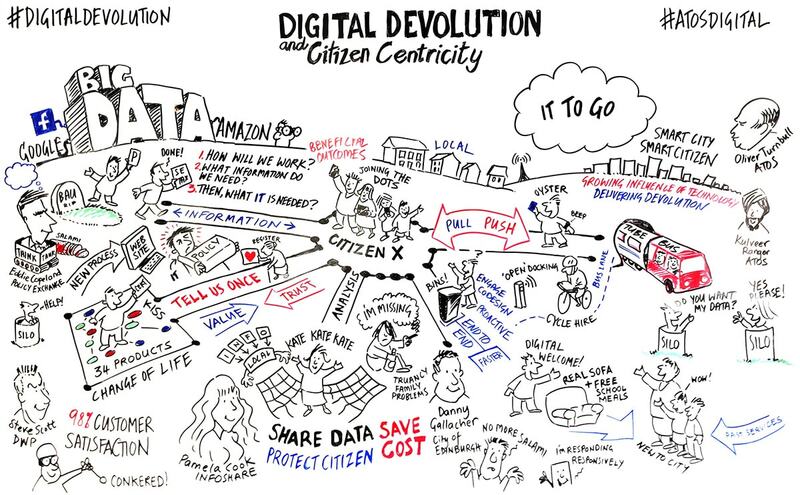 Overlooking it all are Google and Amazon who, of course, already do joined-up digital data rather well. The notes were drawn on a whiteboard live at the event and sponsored by Atos. Cartoon sketch notes are a good way to record an event. In this case I was drawing notes on job interview technique for Room for Work run by Robin Bell. It is a handy way of remembering what was said and is great fun to do. Most of the notes I now take are drawn on an iPad which has the added advantage of being able to be played back as an animation. If you are interested in discussing a project or wish to see more work please call David on +44 (0)20 8546 3462 or contact him via the Contact page, LinkedIn or email.